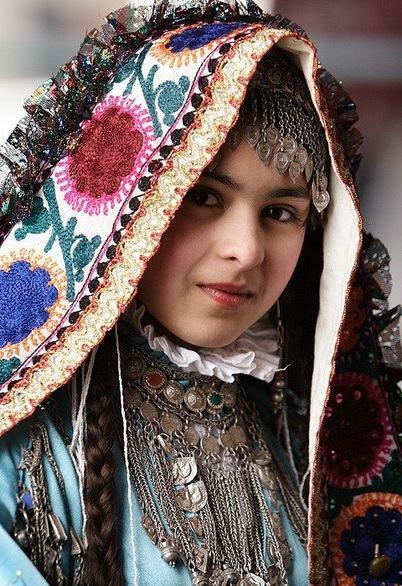 There’re 2 types of traditional costume in Tajikistan: the Northern and the Southern. The composition of both Tajiks costumes is the same, but ornamentation and semantics of many motifs, decorations and forms of headwear differed. Modern designers are interested in traditional Tajik dress because of its functionality, comfort, simplicity and beauty. The main components of women’s costume are shirt dress, belted clothing (sharvar), kerchiefs of scarves and headdress (skullcap – tupi). 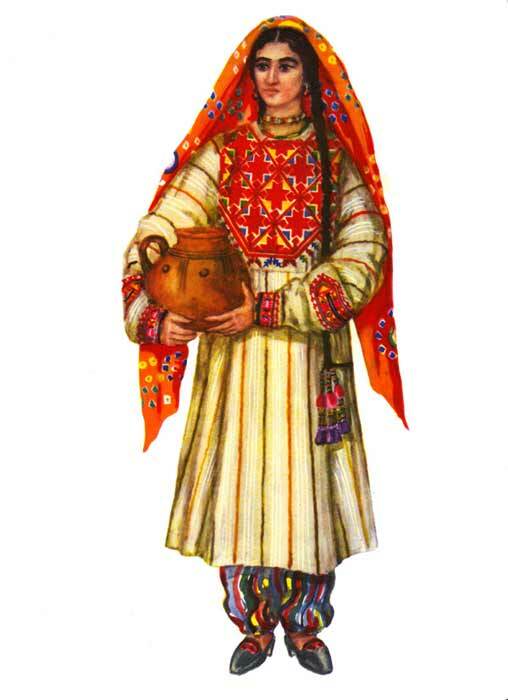 One of the main parts of Tajik women’s costume is belted clothing in the form of the sharvar. They fastened at the waist with a belt made of braid, threaded through at the top of the trousers. The sharvar’s existence in modern dress indicates that they are standart because of its convenience, function, beauty and the format. Monochrome fabrics are mostly used material for dress making. It’s usually decorated with embroidery (gulduzi) and golden ornaments (zarduzi). Atlas (satin) is used rarely, especially in Dushanbe. It’s interesting that modern designers of northern Sogd (Istaravshan and Khujand) on the contrary use ornamental satin. This material has characterized the complexity of the costume of this region for many centuries. Modern designers of Tajikistan still work in the historically established 20th Century environment. After independence designers reveled in gold embroidery and satin fabrics. Now they are used as decoration and ornament in European design. The form of folk costume was transformed into modern examples in very general details and the silhouette of an item was reflected without having the internal design lines. The most popular designers nowadays are Mavlyuda Khamrayeva, Ravshana Sheralieva, Khurshed kuchkaliev and Mukarramah Kayumova.